Can Your Shoes Cause a Car Accident? Car accidents are caused by a lot of things: distracted drivers, people who drive too fast, motorists who follow too closely. But what about footwear? It may seem kind of silly to blame a driver’s shoes for cause a car accident, but the shoes you wear while driving can actually play a significant role in how safely – or unsafely – you drive. If you have been hurt in a car accident in West Palm Beach, Fort Lauderdale, Boca Raton or the surrounding areas, call a Florida car accident lawyer to get the help and advice you need. When you consider how much you use your feet to drive, it’s easy to see how your shoes can affect your ability to safely navigate and control your vehicle. You probably wouldn’t attempt to steer your car while wearing a pair of boxing gloves, and you probably wouldn’t try to press the accelerator or the brake pedals with skis strapped to your feet. What you may not realize is that other, more ordinary types of footwear can interfere with the task of driving. Here are a few types of footwear that can trip you up behind the wheel. Flip flops. Ubiquitous throughout the Sunshine State, flip flops can be dangerous for motorists. Self magazine summarized a British study that linked flip flops to 1.4 million car accidents each year. In a survey of 1,055 British drivers, seven percent said flip flops had caused an accident or a near-crash. The same study revealed that wearing flip flops doubles the time required for a driver to move his or her foot from the gas to the brake pedal. High heels. Pumps, heels, stilettos – whatever you call them, high heels can impede your ability to drive safely. The pointy heels can get stuck in floor mats and carpeting, making it difficult for a motorist to press the brake to avoid a collision. In France in 2014, the country’s supreme court denied a female motorist compensation for injuries sustained in a crash because her high heels got stuck under the pedals as she drove. The crash resulted in three serious injuries and the death of a child passenger. Slippers. It’s tempting to throw on a pair of slippers to run down to the corner store or pick up a quick meal from a local fast food restaurant. Just because you’re going for a short drive down the street, however, doesn’t mean you’re not at risk of being involved in an auto accident. Slippers are designed to be worn around the house, and to slip on and off easily. 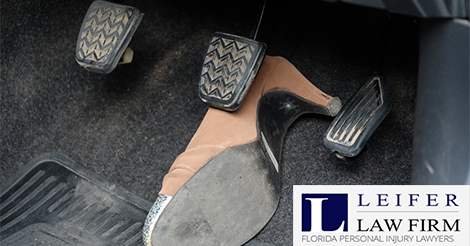 If a slipper falls off while you’re driving, it could easily become wedged under the pedals, leading to a potentially serious accident. No shoes at all. It may be legal to drive barefoot in Florida, but it’s certainly inadvisable. Without proper traction and support, your feet can easily slip off the pedals, causing you to lose control of your vehicle. Car accidents are common. No matter how carefully you drive, you’re always vulnerable on the road. You can’t control how other motorists drive, but you can do something about your own behavior behind the wheel. Wearing appropriate footwear is just one decision that can mean the difference between getting to your destination safely and ending up in a collision. To reduce your risk of an auto accident, pick shoes that stay firmly on your feet instead of sliding around or dangling off your heel. You should also select footwear with a firm yet flexible sole that gives you traction on the accelerator and brake pedals. If you must wear heels, flip flops, or another potentially hazardous shoe for an event, such as a wedding or a day at the beach, take an extra pair of shoes along for the drive and change when you reach your destination. Do I Need a Lawyer for a Car Accident Injury? Have you been injured in a car accident in Florida? Get in touch with a West Palm Beach car accident lawyer today.